MSC Cruise Special | Contact Us for Details! 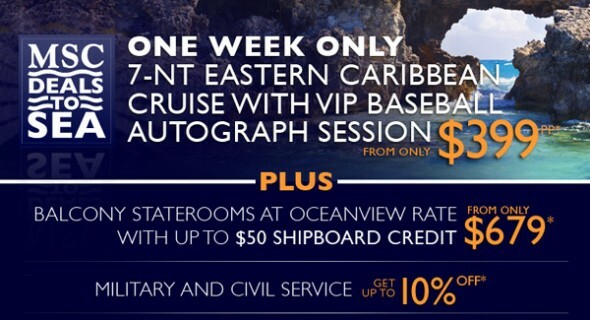 *Rates are USD, per person, double occupancy, cruise-only valid for new retail bookings for U.S. and Canadian residents. Rate shown is for a Category 1 stateroom on the April 6, 2013 sailing aboard MSC Poesia. 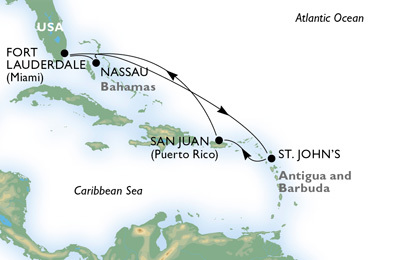 Government fees and taxes (GFT) of $72.41 per person for all sailing guests are additional. SBC of $25 per person (max $50 per cabin) applies to balcony staterooms and above. MSC Cruises reserves the right to pass on any fuel surcharge without prior notice to all guests. MSC Club discount is applicable. A discount of up to 10% (not combinable with MSC Club discount) is also applicable to active and retired U.S. and Canadian military, civil service, and intelrine personnel and their spouses, dependent children, parents, and parents-in-law. Qualifying guests must present an I.D. badge from their respective organization at time of booking. $100 per person deposit is applicable on bookings made more than 75 days out from sailing. Offer is capacity-controlled, subject to availability, cannot be combined with any other discount or promotion and may be withdrawn without notice. MSC Cruises reserves the right to refuse to honor any prices/sailings that are erroneously printed or quoted. Other restrictions may apply. Ask for “MSC Deals To Sea” when booking. Offer Expires March 13, 2013. Ship’s registry: Panama. Enjoy these one week early booking offers to the Caribbean, Mexico, Costa Rica and the Bahamas! With our Air Credits promotion you can choose from our resorts across five exotic Caribbean islands: Jamaica, St. Lucia, Antigua, Bahamas and Turks & Caicos. Experience a Luxury Included® Vacation where everything is included. From romantic beachfront settings, luxurious accommodations including butler service in top-tier suites, specialty dining at up to 15 restaurants, unlimited premium brand drinks, to thrilling land and water sports with scuba diving, only Sandals and Beaches resorts can give you more quality inclusions than any other resorts on the planet. Book your vacation by Jul. 26, 2012 and get up to $555 air credit on stays of 6-paid nights or up to $150 on stays of 3 to 5-paid nights* for select travel dates. Hurry and save up to 65%! Jamaica’s only resort with a private offshore island!! 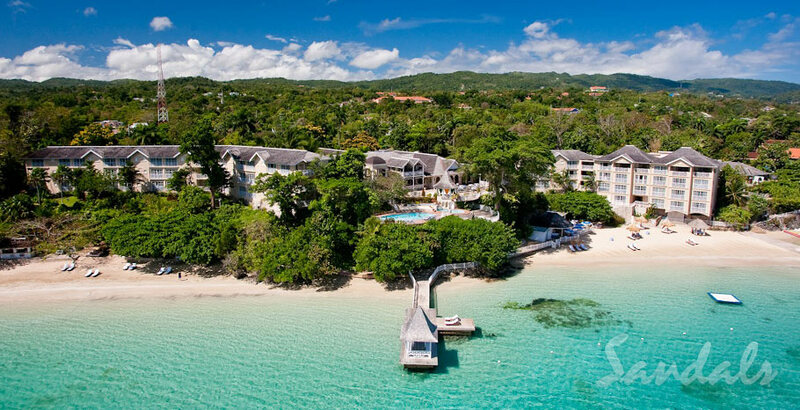 For the ultimate in exclusivity and indulgent pampering, escape to Sandals Royal Plantation, a Jamaica all-inclusive resort and spa in Ocho Rios. Sandals Royal Plantation is the only all-butler, all-suite boutique resort in the Sandals collection.Nestled within a magnificent coral bluff on Jamaica’s lush north coast, this intimate resort of just 74 ocean-view suites is renowned for its impeccable service, unmatched attention to detail and retro-chic sophistication – complete with all the world-class amenities for which Sandals in renowned. Come explore the quieter side of Sandals at the world’s only all-inclusive resort to be granted membership in the prestigious Leading Small Hotels of the World®, and the only Leading Spa® in all of Jamaica. Boasting a charming intimacy in an atmosphere of aesthetic sophistication, this five-decade gem of history was a favorite of Noel Coward and Ian Fleming back in the day. The range of impressive amenities includes a bluff top freshwater pool with two whirlpools and poolside butler service, beach butler service including dining and cocktails on the west beach; and Sandals’ comprehensive scuba diving program with a water sports pavilion on the east beach. Lovers of golf will be treated to complimentary green fees at the nearby 18-hole course at Sandals Golf & Country Club. For your dining pleasures, the award-winning Le Papillion serving French cuisine is one of the resort’s three gourmet restaurants, while the chic CBar is the island’s only champagne & caviar bar. Exclusive privileges at neighboring Sandals Grande Riviera expand your dining options to 11 more venues. 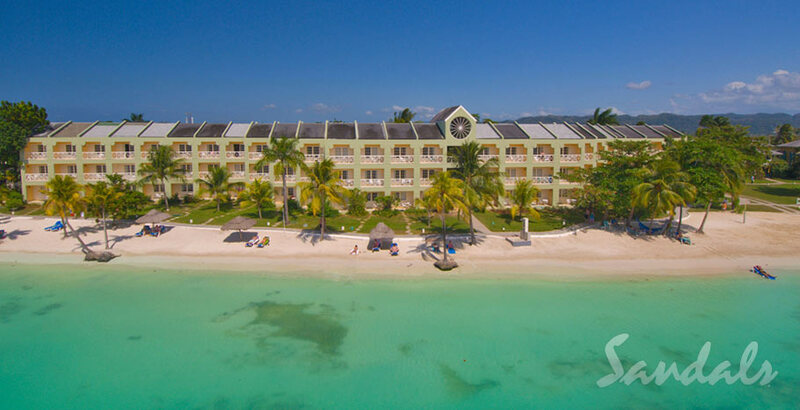 Catering to those who appreciate refined elegance with an authentic island experience, Sandals Royal Plantation is the quiet side of Sandals and the ideal retreat for whenever you need to recharge. 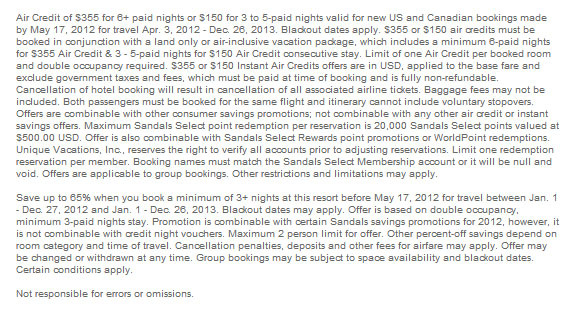 Learn more about Sandals Royal Plantation. 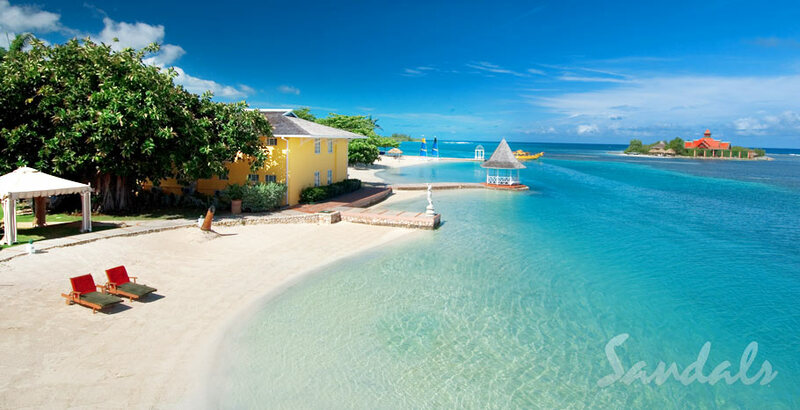 As Jamaica’s most alluring retreat, Sandals Royal Caribbean takes you to opposite sides of the world from its regal – British Manorand mannerisms – to the mysterious Orient on a private offshore island minutes from the resort. Set along a pristine ribbon of beach in Montego Bay, the Jamaican resort’s elegant British accent begins with a proper arrival through a grand port cochere to a noble Georgian-style Great House surrounded by tropical gardens. This is where the highbrow side of you will enjoy continental breakfast in bed and afternoon tea. 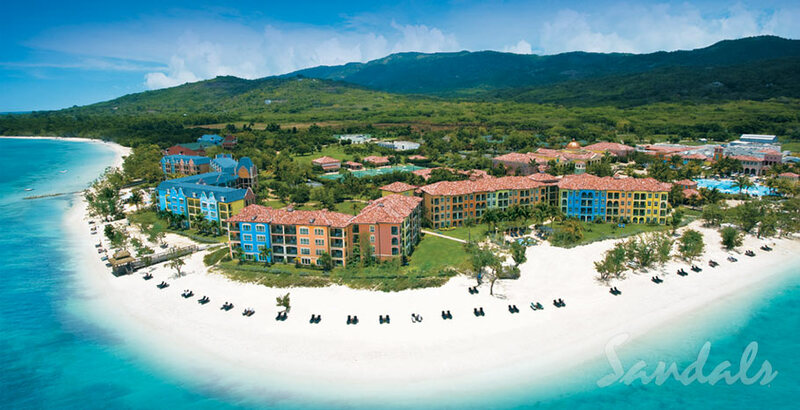 Learn more about Sandals Royal Caribbean. Spanning Negril’s famed Seven-Mile Beach, Sandals Negril conjures up tropical vibrations with a casual, understated elegance. Stroll through walkways dotted with swaying palms and sea breezes, while listening to the hypnotic sound of waves.Experience romantic moments created by the most amazing sunsets. Savor world-class cuisine at breathtaking, oceanfront restaurants. Relax and enjoy luxurious accommodations, steps from the Jamaican beach, including some of the most unique suites in the world with butler service where you can swim-up to your private patio. 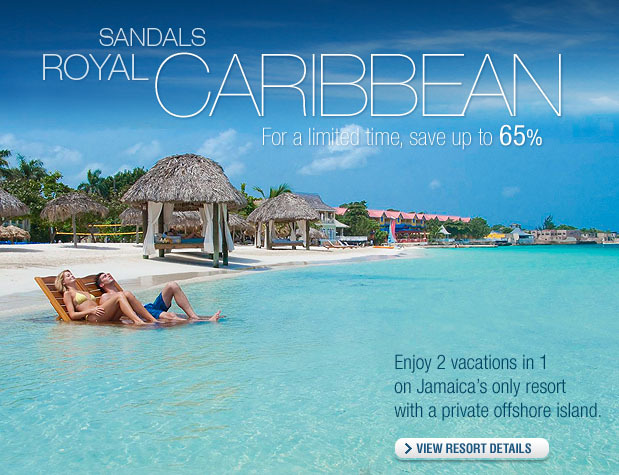 Stay at Sandals Negril and indulge in the Caribbean’s ultimate beach resort. 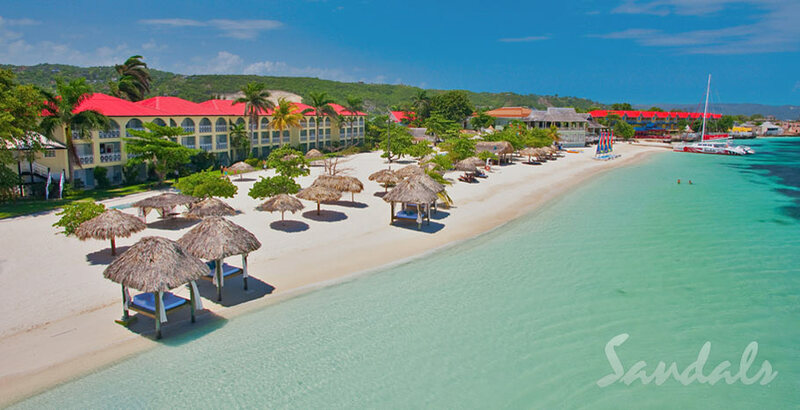 Learn more about Sandals Negril.